A few weeks ago I posted an image on my Flickr account of a building near my home. Just visible over the top of the building in that image were the tips of the three red and white smoke stacks you see here in this image. 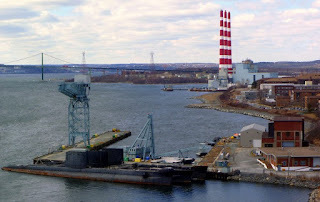 My friend Sara, with whom I went on the Harbour Hopper Tour back in August, sent me a message informing that the smoke stacks were located in a neighbourhood known as Tufts Cove. As I was cycling across the Macdonald Bridge to work one morning I noticed these smoke stacks for the first time and took this picture. The name Tufts Cove comes from a prominent Boston area family that came to Dartmouth in 1749. The land itself was also the location for a Mi'kmaq settlement known as Turtle Grove, until 1917 when it was destroyed in the Halifax Explosion. To be honest though, this isn't so much a HRM Point of Interest, as it is an EP Dave's Point of Interest. The only reason I included this image is because I have seen these prominent stacks in various images of the Halifax Harbour since I came here. However, I could never figure out where they were located, and neither could I find anyone who could remember either. For this reason alone they had become like an annoying itch in my mind of which I just could not rid myself. And so, like a deeply satisfying scratching of a peeling sunburn, I present you this post so that I can relieve myself of this itch, and perhaps even save you from my "pain" also. I really do aim to provide a public service here at EP Dave's Terra Nova. And last, but certainly not least, love the shot. The subs in the foreground are cool.